I’m ridiculously happy to discover that there’s a circuit bending workshop happening in Nashville on Sunday, March 13th at 2 p.m. Little Harpeth Brewing is hosting “Circuit Bending: Exactly What Your Mom Told You Not To Do As A Child.” The workshop is led by multimedia artist McLean Fahnestock and presented by Gallery Luperca. If you want to attend the 3-hour event, order your tickets now. Space is limited, and they need time to know how many parts to order. Here are the details from the event page. 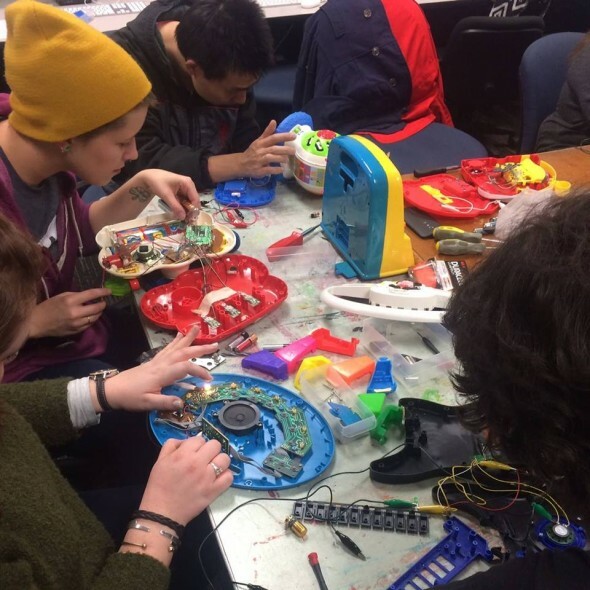 Circuit bending is the creative, chance-based customization of the circuits within low voltage battery-operated toys and gadgets to create new musical or visual instruments and noise-makers. Bring an old, used toy that still works, open it up, and learn how to make it into your own sound machine. This workshop will get you started. We will cover the basics of circuit exploration, soldering, and switches. The $25 class fee covers an assortment of parts for you to try. Basic tools will be provided but you are welcome to bring your own kit if you would like. Bring a toy or two and make sure you have batteries!